Your child will learn about negative and positive integers while determining the direction of temperature on a thermometer with this fun card game. If he draws a red card, the temperature moves down. Drawing a black card makes it move up. The player who reaches the boiling point (100° C at sea level) on the game board first is the winner! Help your child create the game board by taping three sheets of paper together vertically to create one very tall piece of paper. Have him draw a giant thermometer. It should extend through all three sheets of paper. Ask him to mark the bottom of the thermometer with a "0,” and the top with "100" to indicate the numeric value of degrees Celsius. Make a line for each 5 degrees from 0–100. Shuffle the cards and place them face down next to the thermometer game board. Each player should place his marker (penny, bean, etc.) at body temperature—37 degrees Celsius. Have each player take a turn choosing a card from the deck. Red suits represent negative integers (moving down), and black suits represent positive integers (moving up). 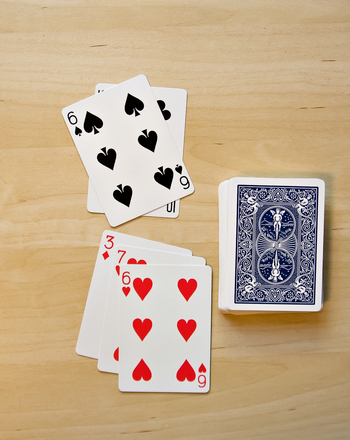 Each player moves up or down the number of degrees equal to the value on the card they chose. Players have the option of passing their turn if they want. If a player reaches the freezing point (0), he's out. And, if a player lands on the same space as someone who's already occupying that space, they move forward (black) 10 degrees. Whoever reaches the boiling point first wins! Helpful Tip: For a simpler version of this game to play with younger children, start the game board at "0" and use only positive numbers.